Attract your dream house and live how you really want to with the power of subliminal audio and principles from the law of attraction. Do you dream of owning your own house? Do you have a dream house in mind already? Perhaps your dream house is a mansion with guest bedrooms for your friends and family, a swimming pool and a huge garden? Or maybe your dream house is in a different location, perhaps on the beachfront with a walk out onto the sand? Or on a hillside with a view for miles around? If you have a bigger vision for where you would like to live, and if you are focused on achieving the goal of owning your own house.. your dream house, then this unique subliminal mp3 can help you. Perhaps up until now you have used the law of attraction with little result. You have been visualizing, wishing for, even saying affirmations.. but still you don't own your dream house. Don't worry, you are not alone, for 99% of people trying to manifest it isn't quite so easy as it is in the books or movies.. However, our album really can help.. it isn't magic, it isn't instant, and it still requires that you put physical and conscious effort but our subliminal messages really will give you an advantage.. This album works in a simple way. It gives you subconscious support towards your manifestation goal. You see many people try visualizing, or saying affirmations, they may even cut out pictures of their dream house.. yet deep down within their subconscious mind there are sabotaging thoughts, negative thoughts, and a lack of belief.. deep down it is hard for us to believe that it is really possible! This is where subliminal audio comes to help. By using subliminal messages you can achieve a much better result with the law of attraction - because they target your subconscious mind to make sure you have subconscious belief and that your subconscious thoughts are 100% aligned to your conscious thoughts and your physical actions. So, when you add subliminal messages to your efforts they will rewire these negative beliefs, and fill your mind with positive thoughts and really focus you on your attraction goals - in this case on attracting your dream house. You'll lose the negative and limiting beliefs that were holding you back. The Law of Attraction need your 100% belief in order for it to work and now you'll have it - your conscious and subconscious working towards the same goal. You'll start noticing the opportunities to get your dream house. As your thoughts become more focused and positive, you'll start attracting all sorts of opportunities to make your dream house your reality - be it to get it cheaply, or even to inherit or win it! You'll be driven to seize these opportunities! The energy of your focused positive thoughts won't let you sit and let the chance to get the house of your dreams pass you by - you'll be driven to do what it takes to get it! Download these powerful subliminal mp3s today and and bring your dream house into your reality. This album is just one album in our subliminal law of attraction collection. It uses specific subliminal suggestions designed to attract your dream house. Each of our albums contains 5 tracks; Ocean, Fire, Wind, Thunderstorm, and a completely Silent track. These 5 tracks contain the same affirmations (which you can see to the right) - we include 5 different tracks purely to give a variety of sounds for you to choose from if you prefer one type over another. * These samples are representative of what you will hear but do not contain any subliminal messages. + Our Exclusive eBook Completely FREE! 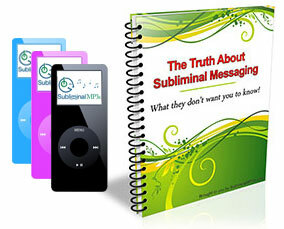 Our Free eBook: "The Truth About Subliminal Messaging"